SOURCE: Soul and Vibe Interactive Inc.
MINNEAPOLIS, MN--(Marketwired - Oct 8, 2015) - Soul and Vibe Interactive Inc. (OTCQB: SOUL), or the "Company," a video, mobile, and computer games publisher, today released its interactive storybook, "Johnny Tractor and Friends: County Fair" (also known as Johnny Tractor County Fair), on the Android platform via the Google Play and Amazon marketplaces. 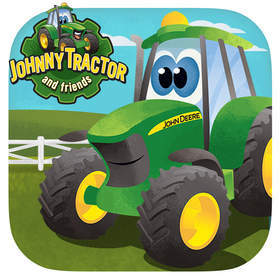 On September 2, 2015, Johnny Tractor and Friends: County Fair was previously launched on the App Store for iPhone, iPad, and iPod Touch. "We are very excited to expand the release of Soul and Vibe Books' first interactive storybook to the Android platform via the Google Play and Amazon marketplaces. The expansion will enable us to broaden the customer base for our interactive book offerings," said Peter Anthony Chiodo ("Tony"), Soul and Vibe's CEO and President. "The interactive book category is a growing segment of the digital content marketplace. Through interactive books we expect to further expand our product line, build new brands, and generate revenue. Our company-wide strategy of multi-platform support is now demonstrable across our game, music, and book offerings. Diversified product category releases and multi-platform support brings the Company one step closer to completing its objective of creating a recurring release calendar. Through a recurring release calendar, the Company believes it will be able to develop and launch more content, which, we anticipate, will enable us to generate revenue and provide a more steady stream of tangible news for our investors and customers." In this endearing interactive storybook that teaches the importance of teamwork and friendship, emerging readers help Johnny Tractor, Corey Combine, and Allie Gator get Merriweather Farm ready for the County Fair. Johnny Tractor and Friends: County Fair is a fully narrated storybook; young readers can read along with the narrator, or independently. The independent reading mode is designed to instill reading confidence. Merriweather Farm comes to life through a wide variety of interactive content and activities as each page of the storybook is explored via fingertips. Well suited for preschoolers and young readers, Johnny Tractor and Friends: County Fair promotes early and emergent literacy, helps increase reading comprehension, and introduces the concept of cause and effect relationships. For more information on the Johnny Tractor and Friends: County Fair interactive storybook and to view its official teaser trailer, please visit the official Soul and Vibe Books and Johnny Tractor and Friends: County Fair pages on Facebook. In April, the Company announced it had signed the Missouri-based developer, Black Lantern, to develop a four-product line of entertainment apps based on licensed brands and original Soul and Vibe Intellectual Property ("IP.") Johnny Tractor and Friends: County Fair is the first entertainment app to be born from this agreement and is the first John Deere licensed-brand product to be published by Soul and Vibe. The Company anticipates the second product in the interactive book series will be launched during the 4th Quarter of 2015, and that additional products in the line will be launched, one per quarter, through the 2nd Quarter of 2016. Soul and Vibe Interactive Inc. (also Soul & Vibe Interactive Inc. on www.sec.gov) is a publisher of games and games-related content for consoles, mobile devices, and personal computers addressing a market projected to grow to $82 billion by year-end 2015. The Company specializes in the creation of original intellectual properties and has extensive experience licensing world-renowned brands from influential companies. Soul and Vibe has license agreements with General Mills and Deere & Company, and game development and publishing agreements for the Xbox 360® video game and entertainment system, Windows 8, Windows Live, and Windows Phone from Microsoft, and the PlayStation® 3 computer entertainment system and PlayStation® Vita (PS Vita) from Sony. Through partnerships with technically sophisticated software developers located all over the world, Soul and Vibe transforms unique concepts into engaging, highly accessible, and affordable games and entertainment experiences. www.soulandvibe.com. Black Lantern Studios, Inc. is an independent interactive entertainment software developer for consoles, handheld, mobile devices, and the PC. Founded in 2003 and headquartered in Springfield, Missouri, Black Lantern is committed to providing the highest quality, richest, and most satisfying gaming experience to its customers, and delivering value to its publishers and partners. For more information about Black Lantern Studios, please visit www.blacklanternstudios.com or e-mail info@blacklanternstudios.com. About this company Soul and Vibe Interactive Inc.
Johnny Tractor and Friends: County Fair (also called Johnny Tractor County Fair) is an interactive storybook by Soul and Vibe! Available now on Google Play, Amazon, and the App Store!